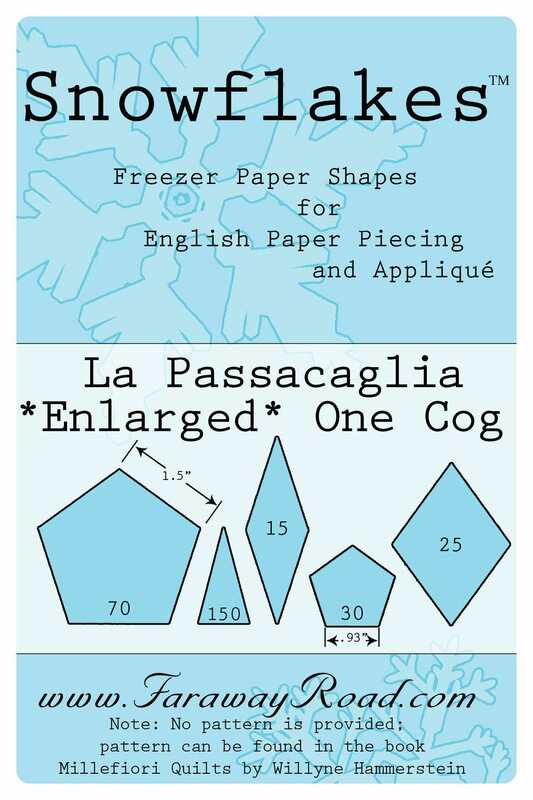 Set of Snowflakes Freezer Paper Shapes to make one complete cog from Willyne Hammerstein's La Passacaglia quilt. This set uses large pentagons which measure 1.5" on each side, and small pentagons which are around 1". (In the original quilt, the large pentagons are 1.25" on each side and the small ones around .75"). This set is just a little enlarged so the triangles don't seem quite so tiny, and the finished piece is about 20% larger. Instructions and graphics are NOT included- for that you will need to purchase a copy of Willyne's book, Millefiori Quilts, published by Quilt Mania. **Please note! 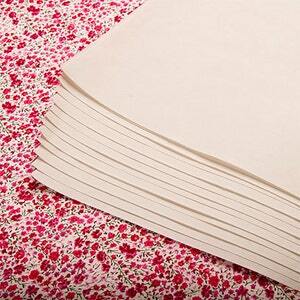 I provide this set in case you may want to make a pillow or mini quilt with a complete cog. 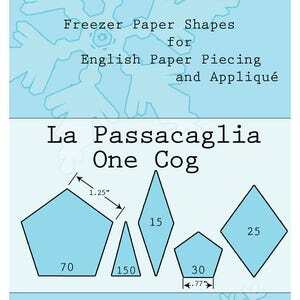 But, there are no complete cogs in the actual La Passacaglia quilt. If you are buying this as a starter pack for the quilt, make sure you have the pattern and leave part of the cog open to fit against its neighbors in the quilt! If you do buy one cog and then decide you'd like to make the rest of the quilt, please contact me and I will be happy to make up a set for you with just the remaining pieces. The cost will be the full set minus the cost of the one cog. 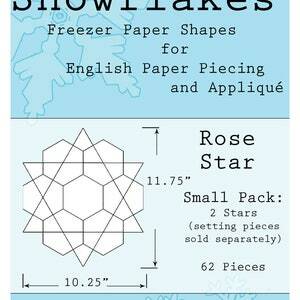 Snowflakes Freezer Paper Shapes are professionally die-cut and sturdier than grocery store freezer paper. 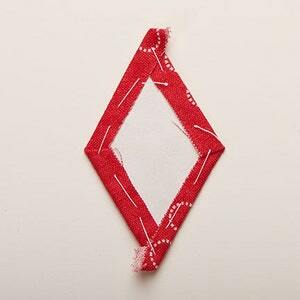 These shapes iron on to your fabric before cutting, eliminating marking and additional templates while conserving fabric. They remain "stuck" while you baste your shape, eliminating pins and paper clips and keeping the fabric from shifting while you sew, then peel off cleanly when stitching is done. I have these shapes cut in a factory in New England, then package them myself in my smoke-and pet- free studio. They are designed to be a hair's width smaller than the nominal size to allow for the width of the fabric, making combining shapes and sizes a breeze.